I woke at dawn on Thursday in Salida, CO and decided to grab breakfast at the Little Red Hen Bakery before heading to the local whitewater park to surf. Still in a haze sans my daily caffeine, I noticed a stranger attempting to get my attention on the sidewalk. "Do you see that over there?" he asked enthusiastically as he pointed to the mountains. "We live in the most beautiful place in the world!" he exclaimed. It’s hard to disagree. This beach town in the mountains is everything a river surfer could ask for: gorgeous park and play waves, stunning stretches of class II/III whitewater, delicious restaurants and breweries, and a population of friendly outdoor enthusiasts and artists that adore their river. When you head to the heart of the Rockies to attend the country’s oldest whitewater festival, you are bound to have a good time. Salida locals love their hometown, and the FIBArk (First In Boating on the Arkansas) Whitewater Festival is the ultimate expression of that love. The event has grown from an obscure whitewater boat race in 1949 to a world-famous festival that includes kayak, raft, and SUP competitions, a foot race up the local mountain, live music, local vendors, a carnival, and the infamous Hooligan Race! Every year the entire city is consumed with FIBArk, intent on creating a unique party to celebrate their community on the beautiful Arkansas River. This year was no exception as Salida celebrated its 68th FIBArk from June 19-16, and Badfish SUP, in partnership with Surf Salida and FIBArk, sponsored the Colorado SUP Championship as part of the festival. The Colorado SUP Championship consists of three events: river surfing, head to head SUP cross, and a 10-mile downriver race through class II/III whitewater. Prizes are awarded to the top three contestants in each event and overall. The first event was the surf competition on Friday morning. This was the last stop for the Colorado SUP River Surf Championship Tour, and with 29 men and women competing, there were many strong performances. Spectators lined both sides of the river as competitors participated in 20-minute group heats at Scout Wave. Each participant had an equal number of attempts to catch the wave, and judges scored up to 60 seconds of surf time. The two highest scores for each participant were totaled to determine a winner. Points were awarded for overall surf style and tricks performed. Badfish Team Rider Miles Harvey scored the only perfect 10 of the event, throwing down gorgeous carves, front and back-side 360s, massive grinds, shuvits, and a chop hop for good measure. Tracy Sage won the woman’s division, displaying her surf dominance with stylish carves and grinds. The SUP down-river race, the final event of the Colorado SUP Championship, took place on Sunday morning. Racers started at the whitewater park, and paddled 10 miles through class II/III rapids, including the crux class III rapid at Bear Creek. Badfish SUP posted a video of the mass start here as competitors vied to separate themselves from the pack while paddling through Boat Ramp Hole. With an impressive show of endurance and athleticism, Badfish Team Rider Spencer Lacey won the men’s division, and ULI Team Rider Rebecca Giddens came out on top for the women’s division. · Women’s Division – ULI Team Rider Rebecca Giddens. The full event results can be found on Badfish SUP’s Facebook Page. Mark FIBArk on your calendar now for 2017! 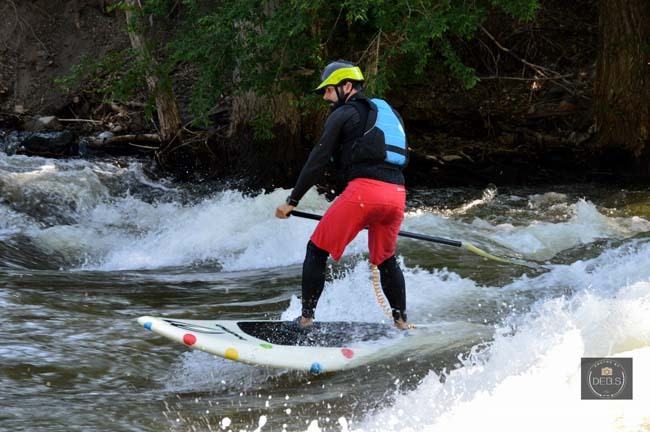 The Colorado SUP Championship in Salida is an experience not to be missed! All Photos from Article below. Click to enlarge.